What is a Cat Friendly Clinic? 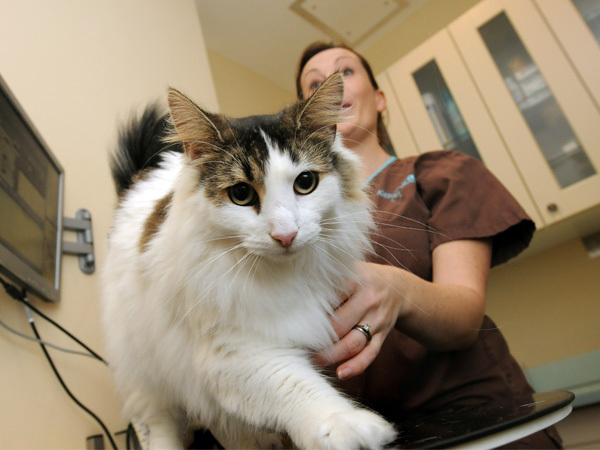 What standards can you expect from a Cat Friendly Clinic? This is a summary of the major criteria needed for a clinic to achieve Cat Friendly Clinic accreditation. The standard is awarded at three levels – Bronze, Silver and Gold. All clinics must meet the minimum criteria (Bronze level) but additional criteria are needed to achieve Silver or Gold level accreditation. The clinical outcome of cases must be monitored and reviewed. Changes in clinic case management protocols must be made where appropriate. The clinic must ensure owners know who is involved with the care of their cats (eg, via a notice board in the waiting room listing members of staff). The clinic must appoint at least one member of staff as a ‘Cat Advocate’, to ensure the Cat Friendly Clinic criteria are adhered to, and to answer any questions cat owners may have. Relevant cat information (leaflets providing advice on transporting cats, choosing cat carriers, giving cats medication etc.) must be readily available for owners. Options for investigations and treatments (and likely costs) must be discussed with owners and written estimates and itemised invoices must be provided if requested. The premises must be of good clinical standard, be clean and hygienic. If consultations take place on the premises, a suitable waiting room must be provided. Efforts must be made to avoid direct contact between dogs and cats in the waiting room. The waiting room must be either a cat-only waiting room, or have a separate cat waiting area with appropriate barriers to prevent visual contact between cats and dogs. Because cats feel safer high up, shelves, benches, tables or stands should be available so cats (in their carriers or baskets) can be placed safely above floor level. Because sight of another cat can be stressful and because close proximity to another cat can be a risk for spread of infectious diseases, vertical barriers must be incorporated between cats in their carriers – as a minimum, clean washed covers should be placed over cat carriers. Where consultations take place on the premises, a suitable dedicated, clean, hygienic and appropriately equipped consulting room must be provided. The length of a routine consultation must be an absolute minimum of 10 minutes (although longer is strongly recommended) to minimise stress for the cat and to allow ‘cat friendly’ handling. Hands, surfaces and equipment must be washed/disinfected appropriately between handling of (and use with) all feline patients. To help minimise stress for cats, there must be at least one consulting room that is primarily or exclusively used for cat consultations. The length of routine consultations must be an absolute minimum of 15 minutes. If hospitalisation facilities are available within the clinic, they must meet the Silver criteria as listed below. Because transporting cats to different clinics causes stress, and because hospitalising cats in small cages may cause stress, at Silver level, facilities must be available for routine hospitalisation of cats in a dedicated hospital ward with cages of sufficient size. Dogs and cats must be separated, as far as possible, in the hospitalisation ward and both noise and visual contact between them should be minimised. Hospital cages must have a solid opaque floor. 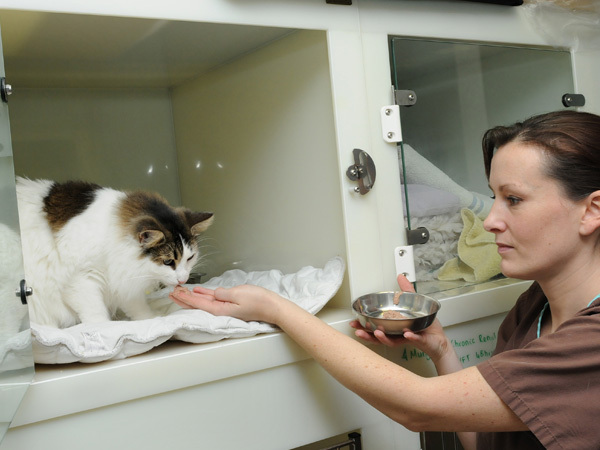 Walls and ceiling should also ideally be solid and opaque, but if they are made of mesh or bars, a cover must be available and used so that visual contact between cats is avoided and a sneeze barrier is created (to reduce the risk of spread of infectious diseases). For cats hospitalised up to 24 hours, cages must have a minimum internal floor area of 2700cm² (eg, 45cm x 60cm) and have at least 39cm internal height. For cats hospitalised longer than 24 hours, cages must have a minimum internal floor area of 3600cm² (eg, 60cm x 60cm) and have at least 55cm internal height. When kept in the hospital overnight, owners must receive information on the level of supervision their cat will receive. Comfortable soft bedding must be used for all hospitalised cats (this may include towels, blankets, acrylic bedding, ‘igloos’, etc.). To help reduce stress, the cage must include somewhere for the cat to hide (eg, a sack bed, an ‘igloo’ bed, a high-sided box etc.). Hospitalised cats should be regularly checked and there must be an examination by a veterinarian at least once every day they are hospitalised. There must be a separate quiet, calm, cat-only hospitalisation ward for all cat patients. All cages used for overnight accommodation or longer (with the possible exception of temporary cages used for isolation etc.) must have solid opaque floors, walls and ceilings. For cats hospitalised up to 24 hours, cages must have a minimum internal floor area of 3600cm² (eg, 60cm x 60cm) and have at least 55cm internal height. For cats hospitalised longer than 24 hours, cages must have a minimum internal floor area of 6300cm² (eg, 70cm x 90cm) and have at least 60cm internal height. For any cats hospitalised for more than 24 hours, there should be the ability (wherever possible) for cats to sit somewhere high as well as hide in the cage (eg, the cage must have a shelf or platform of some sort so that the cat can rest above floor level, as this also helps to reduce stress. There must be the ability to isolate a cat with a contagious disease in a separate area away from all other patients. For a Bronze level clinic there is not a requirement to have an operating theatre in the clinic, but an arrangement must be in place with another local clinic to enable surgical operations to be performed when necessary, and those facilities must meet Silver criteria outlined below. If anaesthesia and surgical operations are performed within the clinic, facilities must meet the Silver criteria below. Appropriate equipment must be available to induce and maintain general anaesthesia in cats and kittens, including equipment to administer oxygen, provide resuscitation and maintain body temperature. There must be a dedicated operating theatre available at all times. Additional equipment for anaesthesia monitoring must include pulse oximetry (to measure oxygen levels in the blood of cats), and a blood pressure monitor. A trained member of staff must monitor general anaesthesia and anaesthetic charts must be filled out for all except very short or emergency procedures. Surgical operations for the purpose of modifying the appearance of a cat or for other non-medical purposes (including declawing) must not be carried out. For a Bronze level clinic, the ability to perform surgery is not required, but an arrangement must be in place with another local clinic to enable this when necessary, and those facilities must meet at least the Silver criteria outlined below. If surgical operations are performed within the clinic, facilities must meet the minimum Silver criteria listed below. A range of suitable surgical equipment and suture materials must be available. There must be suitable cleaning facilities for surgical equipment and instruments, and a recognised method to sterilise them between use. Sterile gloves and gowns must be available, and worn for surgical procedures. For a Bronze level clinic, dental equipment and the ability to perform dental procedures is not required, but an arrangement must be in place with another local clinic to enable this when necessary, and those facilities must meet at least the Silver criteria outlined below. If dental procedures are performed within the clinic, facilities must meet the Silver criteria listed below. A selection of appropriate equipment for performing manual teeth cleaning and other dental procedures on cats must be available. Proper dental records and charts must be maintained for each patient. There must be the ability to perform dental radiography (take X-rays of the teeth) to properly investigate tooth disease. Equipment must be available to scale (clean) and polish teeth – high quality ultrasonic dental units are recommended. To avoid risks of cross-contamination, dental procedures must never be performed in the operating theatre. For a Bronze level clinic, X-ray (or ultrasound) equipment is not required, but an arrangement must be in place with another local clinic to enable this to be undertaken when necessary, and those facilities must meet at least the Silver criteria outlined below. Good quality X-ray (radiography) equipment must be available in the clinic, suitable for use in cats and kittens. The X-ray machine must be regularly serviced and maintained in good condition. Appropriate equipment and procedures must be in place to minimise human exposure to X-rays. Records must be kept for each patient X-rayed. Equipment to perform ultrasound investigations must either be available at the clinic, or arrangements must be in place to have easy access to ultrasound when necessary (either on-site or nearby). The clinic must have at least basic laboratory equipment to enable measurement of blood glucose (sugar) concentrations, urine chemistry analysis (eg, urine ‘strips’) and urine concentration (urine specific gravity) with a refractometer. Arrangements must be made for more extensive laboratory investigations, either on-site or through a suitable external laboratory. The clinic must also have a good quality clinical microscope and a centrifuge to be able to separate blood, assess the packed cell volume (PCV, a measure of the red cells in the blood) and to sediment urine samples. There must be facilities in the clinic to undertake additional important blood tests including measurement of sodium (Na), potassium (K), calcium (Ca), urea, creatinine, and total protein. Facilities and stains should be available for preparation of slides from blood, fluid, tissues and urine. Equipment must be available to assess a cat’s blood type.